انصاری, حسین, خدیوی, مهدی, صالح‌نیا, نسرین, بابائیان, ایمان. (1393). بررسی عدم قطعیت مدل LARS تحت سناریوهای A1B، A2 و B1 در پیش‌بینی بارش و دما (مطالعه موردی: ایستگاه سینوپتیک مشهد). نشریه آبیاری و زهکشی ایران, 8(4), 664-672. حسین انصاری; مهدی خدیوی; نسرین صالح‌نیا; ایمان بابائیان. "بررسی عدم قطعیت مدل LARS تحت سناریوهای A1B، A2 و B1 در پیش‌بینی بارش و دما (مطالعه موردی: ایستگاه سینوپتیک مشهد)". نشریه آبیاری و زهکشی ایران, 8, 4, 1393, 664-672. انصاری, حسین, خدیوی, مهدی, صالح‌نیا, نسرین, بابائیان, ایمان. (1393). 'بررسی عدم قطعیت مدل LARS تحت سناریوهای A1B، A2 و B1 در پیش‌بینی بارش و دما (مطالعه موردی: ایستگاه سینوپتیک مشهد)', نشریه آبیاری و زهکشی ایران, 8(4), pp. 664-672. انصاری, حسین, خدیوی, مهدی, صالح‌نیا, نسرین, بابائیان, ایمان. بررسی عدم قطعیت مدل LARS تحت سناریوهای A1B، A2 و B1 در پیش‌بینی بارش و دما (مطالعه موردی: ایستگاه سینوپتیک مشهد). 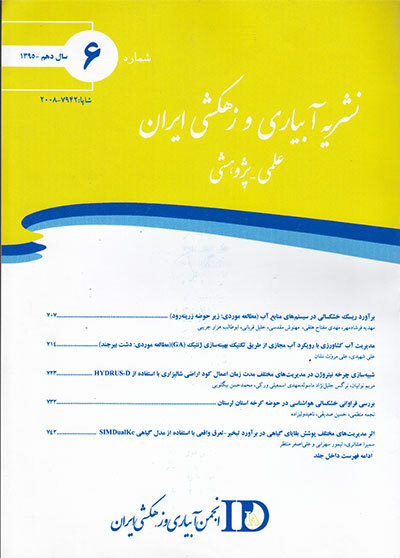 نشریه آبیاری و زهکشی ایران, 1393; 8(4): 664-672. تأثیر تغییر اقلیم در میزان تغییرات بارندگی و دما توسط مدل­های پیش­بینی اقلیمی مورد تحلیل و بررسی قرار می­گیرد. مدل­های گردش عمومی جو و به دنبال آن استفاده از مدل­های ریزمقیاس مانند LARS-WG5 این امر را محقق می­سازد، اما این پیش­بینی­ها با عدم قطعیت روبرو هستند. در این بررسی عدم قطعیت خروجی مدل LARS-WG5 پس از پیش­بینی دو پارامتر بارش و دما طی سی سال 2041-2012 در ایستگاه سینوپتیک مشهد مورد بررسی قرار گرفت. نتایج نشان داد که خروجی این مدل ریزمقیاس با عدم قطعیت همراه است، به­طوری­که تحلیل نتایج نمودار باکس پلات در ایستگاه مشهد نشان داد، مقادیر ریزمقیاس شده بارش در چارک­های اول تا چهارم متفاوت است. با سناریوی A2 و تحت سه مدل HadCM3، GFCM21 و INCM3 در چارک اول 75 درصد داده­های پیش­بینی بارش در ماه مارس به­ترتیب بیش از مقاددیر 95/53، 17/57 و 93/44 میلی­متر و در چارک سوم 25 درصد داده­ها به­ترتیب بیش­تر از مقادیر 86/59، 53/63 و 23/50 میلی­متر می­باشند. The impact of climate change on precipitation and temperature changes by climate predicted models analyzed. General circulation models of the atmosphere and subsequent use of subscale models such as LARS-WG5 make it possible, but these predictions are encountered with uncertainty. In this study, the investigation of uncertainty output of LARS-WG5 model after the forecasting of two parameters of precipitation and temperature over thirty years also studied, from 2041 to 2012 in synoptic station of Mashhad. The results showed that the output of this subscale model does not have certainty, as the amounts of subscale precipitation in the first and fourth quartiles are different in Mashhad station. Through using A2 Scenario and three models of HadCM3, GFCM21 and INCM3 in the first quartile, 75% of the predicted rainfall respectively, over 53.95, 57.17 and 44.93 mm in March, and in the third quartile, 25 percent of the data respectively are greater than 59.86, 63.53 and 50.23 mm. باباییان،ا.، نجفی نیک،ز. 1385. ارزیابی تغییرات اقلیمی ایستگاه­های سینوپتیک استان خراسان رضوی در افق 1400 شمسی(2010 تا 2039 میلادی). گزارش اداره کل هواشناسی خراسان رضوی، ویرایش اول، پژوهشکده هواشناسی. علیزاده،ا. 1386، اصول هیدرولوژی کاربردی. انتشارات دانشگاه امام رضا مشهد. ص:290-265. قویدل­رحیمی،ی. 1383. کاربرد نمای­های مبتنی بر بارش در مطالعه خشکسالی­ها و ترسالی­ها(مطالعه موردی: استان آذربایجان شرقی). مجله پژوهش و سازندگی در منابع طبیعی شماره ۶۵. ص 47 - 56 . Dibike,Y.B., Gachon,P., St-Hilaire,A., Ouarda,T.B.M.J and Van T.-V. Nguyen. 2006. Uncertainty analysis of statistically downscaled temperature and precipitation regimes in Northern Canada. Ghosh,S and Mujumdar,P.P. 2007. Nonparametric methods for modeling GCM and scenario .uncertainty in drought assessment, Water Resources Research, VOL. 43, W07405. Pp: 1-19. Hessami,M., Gachon,P., Ouarda,T., St-Hilaire,A. 2007. Automated Statistical Downscaling, ASD Users’ Guide – Version1.1. Houghton,J.T., Ding,Y., Griggs,D.J., Noguer,M., van der Linden,P.J., Dai,X., Maskell,K., Johnson,C.A (eds) .2001. Climate change 2001: the scientiﬁc basis. Contribution of Working Group I to the Third Assessment Report of the Intergovernmental Panel on Climate Change (IPCC): Cambridge University Press, Cambridge, UK and New York, NY, USA,Pp: 84. Huth,R. 2004. Sensitivity of local daily temperature change estimates to the selection of downscaling models and predictors, Journal of Climate, 17,640– 652. Intergovernmental Panel on Climate Change, (IPCC): 2007, Climate Change 2007: Synthesis Report of the Fourth Assessment Report. IPCC. Jager,H.I and King, A.W. 2004. Spatial Uncertainty and Ecological Models, Ecosystems, 7: 841–847. Kay,A.L., Davies,H.N., Bell,V.A., Jones,R.G. 2009 .Comparison of uncertainty sources for climate change impacts: flood frequency in England. Climatic Change, 92: 1-2. 41-63. Reddy, K.H and Hodges, H.F. 2000. Climate change and global crop productivity.UK, Wallingford. Semenov,M., Stratonovitch,P. 2010. Use of multi-model ensembles from global climate models for assessment of climate change impacts, CLIMATE RESEARCH. 41: 1–14..
Tukey,J.W. 1977. Exploratory Data Analysis, Addison-Wesley. Turley,M.C and Ford,E.D. 2009. Definition and calculation of uncertainty in ecological process models. Ecological Modelling, 220: 1968–1983. Vrugt,J., Ter Braak,C., Gupta,H and Robinson,B. 2009. Equiﬁnality of formal (DREAM) and informal (GLUE) Bayesian approaches in hydrologic modeling. Stochastic Environmental Research and Risk Assessment, 23:7. 1011-1026. Yang,J., Reichert,P., Abbaspour,K.C., Xia,J and Yang,H. 2008. Comparing uncertainty 692 analysis techniques for a SWAT application to the Chaohe Basin in China. Journal of Hydrology, 358: 1–23.